‘Dyna Boy’ Impressions: Why Mine With a Pickaxe When You Have TNT? In my world, there are two ways to go about mining in video games: the safe method, which involves a sluggish and incredibly old-fashioned pickaxe, or my personal preference, WITH EXPLOSIVES! This seems to be something I have in common with Neutronized, as their 20th release, Dyna Boy, is a platformer where you solve problems by… BLOWING THEM UP! KA-BOOM! Rocks blocking your path? Blow them up! Need to lower a bridge to cross a gap? Use the power of TNT! Enemies too troublesome? BLO– alright, enough of that. Your goal in each level is simple: reach the exit. Accomplishing that goal, however, is another matter entirely, and one that involves explosions. Lots and lots of explosions. Color me crazy, but I was beyond thrilled to find that my supply of dynamite was not finite. I threw sticks left, right, at monsters, ladders, everything in sight – because I could! My power was limitless! Or so I thought. My recklessness often caused me to restart levels because, well, I kinda forgot to climb a ladder required to progress, before blowing it up. Oops. But hey, I had fun! Boy, did I ever have fun (especially with those massive chain-reactions). There are some obstacles which dynamite can’t clear though, including diamond blocks, and this is where things got tricky. In order to destroy these, you’ll need to place a TNT crate next to it and blow up the crate, as this will cause a big enough explosion. Unfortunately, these do not respawn, so you’ll have to use them carefully or risk having to restart the level. Happened to me the first time I was faced with multiple crates, but I learnt my lesson after a restart or two. 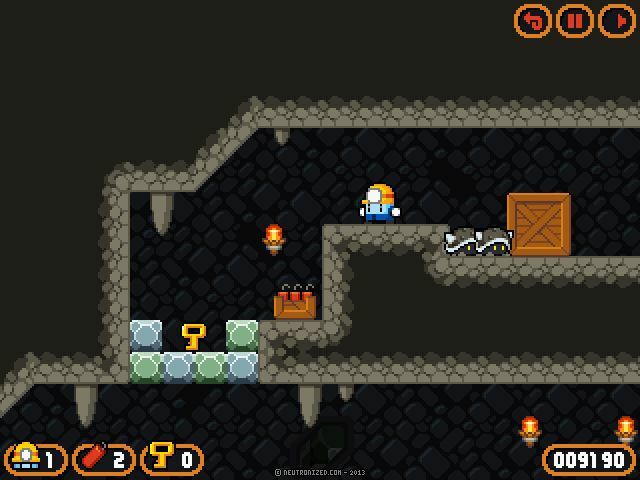 Dig for precious minerals, defeat dangerous enemies, blast your way through the exit of the mysterious cave of Dyna Boy! Ready to wreak havoc and make (almost) everything go ka-boom? Then fire up your favorite browser and take Dyna Boy, for a spin! This also marks the 20th game Neutronized have released, which is very impressive. I’m sure you’ve already played some of their other creations, like the iOS dinosaur smasher Roar Rampage, right? If not, pick that one up once you’re done with Dyna Boy. KA-BOOM!